Posters and Patriotism : Selling World War I in New York is an exhibition taking place on the second floor of the Museum of the City of New York, located on the upper east side of Manhattan at 1220 5th Ave & 103rd Street. On display at its gallery are a large number of posters, prints and photographs depicting local New York artwork, movements and propaganda as they related to the War Effort, as well as, items from abroad. Of the many things to appreciate about this exhibition are the photographs which depict recognizable local NYC spots as they were a century ago. At the bottom of this page you’ll find an image gallery featuring additional photos taken at the exhibition. The following would be specific artwork hanging off the walls and the related details for respective piece. Initially an illustrator for the Chicago Tribune, C.B. Falls moved to New York around 1900 and became a prolific artist of posters, books, and magazine illustrations. He also designed fabrics, furniture, and stage scenery. His poster’s bold, flat planes of color reveal the influence of a self-consciously modern school of European graphic design in early 20th-century New York. Canadian-born New Yorker Charles E. Ruttan had designed streetcar placards advertising Cream of Wheat breakfast cereal and other products. An avid aviator and Naval Reserve officer, he became an official artist for the wartime Navy Department. His poster suggests exciting foreign adventures awaiting new recruits. Flagg used newspaper reports of German atrocities against Belgian civilians to encourage American men to join the marines. Provoking and managing the emotions of viewers was a tactic Flagg and other DPP artists adapted from the ads and magazine images they had created before the war. Posters encouraged American men to see themselves as vigorous heroes bent on avenging German crimes against defenseless Belgian women and children. In New York and across the country, women took the place of drafted men in factories making bombs, shells, and other munitions. Magazine artist Adolph Treidler created this YWCA poster for the United War Work Campaign, a November 1918 drive to raise funds for services for domestic war workers and troops abroad. This public health poster by two Parisian illustrators urged the French to defeat the scourge of tuberculosis just as they will slay the “boche” (German) eagle, shown with a sword through its throat. The term “boche” (blockhead, cabbage head), which they applied to Germans, was adopted by their English and American allies. By 1917, when the United States joined the Allies (France, Belgium, England, Italy, and Russia) against the Central Powers (Germany, Austria-Hungary, and Turkey), Europeans had been fighting on the Western and Eastern Fronts for over two and a half years. Triggered by the assassination of Austro-Hungarian Archduke Frank Ferdinand by a Bosnian Serb nationalist in June 1914, the war became a global contest between Europe’s major powers. The warring nations’ graphic artists produced a vast body of posters, mostly sponsored by their governments but also by private businesses and charities. 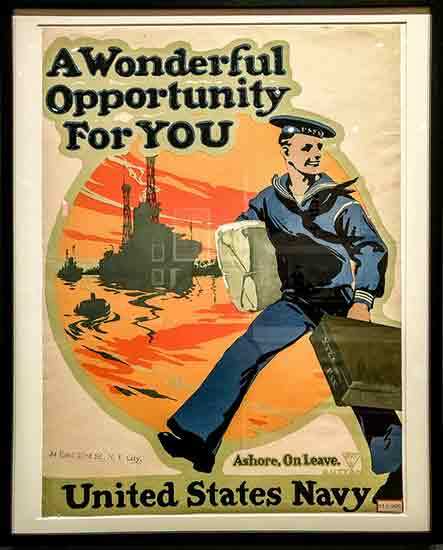 European war posters sought to convince young men to enlist and aimed to persuade civilians to conserve food, donate to medical and refugee funds, and buy war bonds to provide their governments with money for keeping troops armed and fed. The war turned posters, formerly used as a commercial advertising medium, into one of the new century’s most powerful means of mass propaganda. Wartime New Yorkers were influenced by the artistic and psychological strategies used in European posters, camouflage techniques, and other visual arts.